(This image is for illustrative purposes only. Each Incident Command Kit can be customized with ID lettering of your choice including of color panels to be used.) 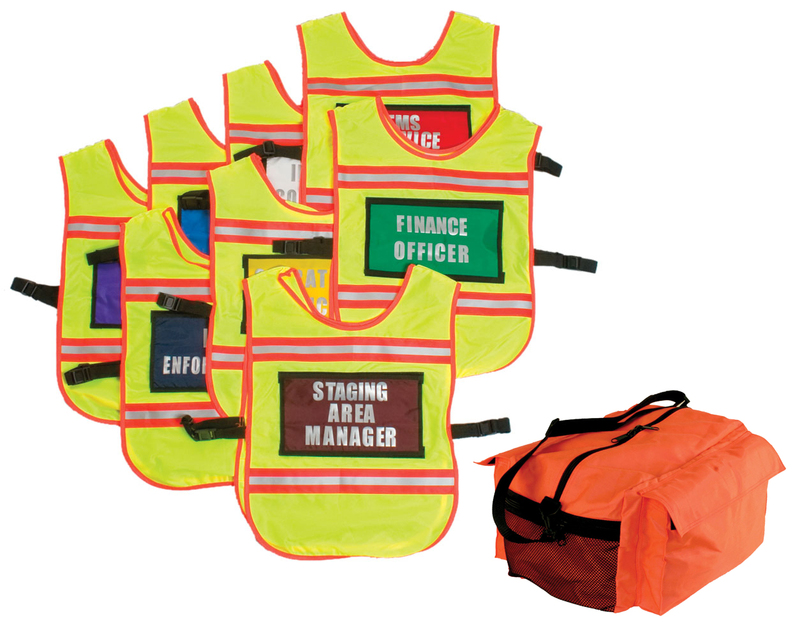 Kit includes eight high-visibility one-size-fits-all ID vests with Velcro strips on vest front and back to attach to velcro on removable color customized ID panels. Vests have 3M™ Scotchlite™ Reflective Material "triple-trim" and adjustable nylon webbing side straps. Kit also incudes eight pair (16) color-coded ID panels with Velcro strips on back for attaching to vests. Available colors include: white, red, yellow, green, navy, royal blue, purple, and burgundy. Panels are lettered in reflective silver to customer’s specifications. Vests and panels come in a sturdy orange storage bag. 3M and Scotchlite are trademarks of 3M Company, used under license in Canada.